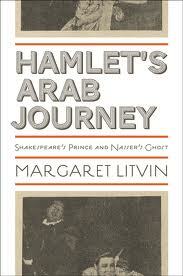 The publication of that paper — and ArabLit’s attempts to stop publishing on the weekends — are a good reason to re-run Hussein Omar’s review of Litvin’s Hamlet’s Arab Journey: Shakespeare’s Prince and Nasser’s Ghost, released by Princeton University Press in 2011. Nasser was not Hamlet, and he was no Macbeth. But once, at the age of sixteen, he was Caesar. At the al-Nahda school in Cairo, the future president of Egypt played the Roman dictator. Nasser’s hagiographers agree that his postal clerk father “all but leaped forward to rescue him” as he was pinned down under Brutus’ dagger. It turns out that Nasser wasn’t alone in having a Caesarian complex. The play at once excited (and appalled) a number of midcentury African dictators. Haile Selassie loved the film Caesar, the Marlon Brando version, but couldn’t bear to watch the assassination scene. When the play was first performed in Addis Ababa in 1952, the Emperor’s censors insisted that the scene be acted out behind a semidiaphanous curtain. And Julius Nyerere, Tanzania’s first president-poet, rendered — for reasons entirely to do with his name, some say — the script into Swahili, making Juliasi Kaizari the first Shakespeare play to be translated into that language. Midway through the opening night at the St. Francis Pugu School in Dar es Salaam, Nyerere’s mother was so affected by the tragedy that she had to leave. But if Nasser and his counterparts liked Caesar, Egyptians loved Hamlet. Today, the proud and vengeful prince is quoted by mild Islamists (Mustafa Mahmud) and radical exiled ones (Yusuf al-Qaradawi), erudite intellectuals (Jabra Ibrahim Jabra) and hysterical ones (Sadiq Jalal al-Azm). Journalists reveled in denouncing a “rotten Denmark” when the cartoon controversy broke out in 2005. And “Shall we be or not be?” (the infinitive “to be” does not exist in Arabic) has become a slogan for “the Arab condition.” In televised debates, Hamlet is invoked by Gulfie preachers and Syrian secularists in exactly the same way to make contradictory claims. He has become an empty and capacious symbol, his words used to argue anything and its exact opposite. In Arabic, Hamlet is Shakespeare’s most translated and most frequently performed play. How Hamlet became so popular (or rather ubiquitous) in Egypt is one of the questions Margaret Litvin sets out to answer in Hamlet’s Arab Journey. For one thing, most Arabs did not encounter him in the classrooms of elite colonial schools, as Edward Said (and his classmate Omar Sharif) famously did. At the turn of the twentieth century Cairo’s theatergoing public came to know him on the musical stage, where he sang wildly popular songs and did not die in the end. This first translation — “an icon of infidelity,” according to Litvin — was based on an unfaithful nineteenth-century French version. Its entrepreneurial translator, Tanyus ‘Abdu, obsequiously appealed to the taste of Egypt’s rising middle classes for a cheerful ending. Perhaps unsurprisingly, it was as a Soviet film, not an Elizabethan text, that Egypt’s intellectuals and artists first encountered the tragic hero. Although a Royal Shakespeare Company Hamlet toured Cairo in 1927 and Laurence Olivier’s film premiered there in 1948, many Egyptians first caught glimpses of Hamlet in the crowded hallways of Russian cultural centers, where Kozintsev’s film Gamlet was on a constant loop. Following the building of the Aswan High Dam in the 1960s, the Soviets launched an aggressive program of cultural diplomacy that, in addition to scholarships, conferences, exhibitions, and translations of pivotal texts, included the screening of the 1964 film. Soviet culture flooded Cairo. (Litvin’s next book, Arab Writers, Moscow Dreams: Forgotten Flows of Twentieth-Century Culture, will tell this somewhat forgotten story.) Gamlet’s police-state images— prison guards and spies, effigies of the dictator Claudius — struck a raw nerve with Egyptians under Nasser just as they did with Russians after Stalin. One director claimed to have seen the film more than ten times. Muhammad Subhi, who traveled from cultural center to center as it circulated — seventeen in all — would later go on to direct Cairo’s most iconic (and commercially successful) production of Hamlet in the 1970s. On any given night in 1960s Cairo, you could watch a John Gielgud version of the film, the Russian one, or a National Theatre Arabic production. Precisely because he came to Egyptian audiences in multiple roundabout ways (Litvin calls it the “global kaleidoscope”), Shakespeare was never seen as a colonial imposition to be resisted. In the eyes of Egypt’s theatergoing public, Hamlet was a global child, not a British one (his colonial parentage was merely incidental). Indeed, there was something about Hamlet that resonated deeply with Egyptians. In 1960s Cairo (“a heady time”), Hamlet appealed to the always-political theater-makers, as both were asking the same questions: of historical agency, authenticity and self-determination. He spoke to audiences that felt caught in a “time out of joint” (the malaise that set in after the crippling defeat of the Six Day War) and orphaned (father Nasser died in 1970). Far from being paralyzed (here Litvin is at her best) intellectuals and artists across the Arab world were liberated by ’67. They began making theater in ever-more creative and experimental ways, addressing not their governments in hidden code, but their publics, in calling them to action. Nasser was not Hamlet, but when he died in 1970, one might say he became Hamlet’s ghostly father. His promises — neither forgotten nor fulfilled — haunted theater-makers for many years to come. Underneath Litvin’s scholarly chill, there is a lyrical elegy: at once she laments the passing of Egypt’s theatrical golden age and the political dream that inspired it. Under Sadat’s program of economic liberalization, politics were pushed out of the theater, making theater appear cynical, useless, and irrelevant. And yet, in spite of her agile negotiation of the uses and abuses of the Hamlet tale, there is something all too familiar about Litvin’s narrative. The historical course that she charts is common to national liberation movements the world over. The unfulfilled promises of anticolonial demagogues and the disappointments they brought are unique neither to Nasser or to his Egypt. The various stages in the transformation of societies, as they shrug off their colonial burdens, in Egypt mirror those in South Asia, West Africa or Latin America. The transformation of territorial nationalism into a muscular but romantic socialism (rudely interrupted by a neoliberal order) is the story of India as much as it is that of Egypt or Syria. Hamlet, in turn, is the story of all these places, and the prince’s concerns are theirs. And yet Egypt is not India, nor is it Kenya; and Egypt certainly is not Chile. As absorbing as it is to follow Hamlet’s Arab Journey, one cannot help but wonder what happens to him when he leaves the Arab world to go abroad. Hussein Omar is a history PhD candidate at Merton College, Oxford and the co-founder of the “Downtown Memory and History Project.” This review initially appeared in Bidoun magazine‘s issue 26: Soft Power. Next ‘Invasion!’ Opens in NYC: Who Is Abulkasem?